RBI Recruitment for officer posts under Grade b posts all over India. Reserve bank of India Recruitment department conducts this examination for RBI Grade b officers every year. All Indian fresher graduate candidates can apply for these bank jobs in India 2018. 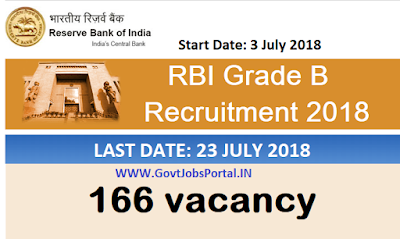 RBI Vacancy for the posts of Grade b officers in various offices of RBI India. Online Bank job applications are invited for the above mentioned posts of RBI Grade b officer. Those who are going to apply these RBI Jobs must satisfied the eligibility criteria which we explained below. So first read the whole article carefully, before applying online for this RBI Recruitment process 2018. What are the various Eligibility Criteria for applying this RBI Recruitment ? Those who are wishing to apply this RBI Recruitment must have age in between 21 and 30 years for all posts. What is the process for Applying this RBI Vacancy? Those who are full filling all the criteria which we explained above related to this RBI Grade b examination can apply online through the RBI official website. There is no off line way for applying these bank jobs in India. You just have to follow the RBI official website for applying online. We also share the reference link below related to this RBI Recruitment process.